The general picture that emerged from subsequent research is that charged particles (protons with an admixture of heavier atomic nuclei), are accelerated to high energies by processes not yet well determined, but probably in part in supernovae and the shock waves of their aftermath. They then travel through the Galaxy, trapped (stored) therein by the galactic magnetic fields about which they spiral under the influence of the v x B force. Some cosmic rays are so energetic they could not have been trapped in the Galaxy. They may well have originated outside the Galaxy. Collisions with the protons of the interstellar gas cause some of the heavier nuclei in the cosmic ray flux to break up (spallation). The element abundances of primary cosmic rays, as measured at energies <1 GeV with satellites, differ substantially from the solar abundances (Table 10. 2). Most notably, cosmic rays have a substantial excess of the relatively rare light elements, Li, B, Be, which are products of the spallation reactions. With knowledge of the gas density in interstellar space (~0.5 x 106 atoms m-3) and the cross sections for the spallation interactions, the modified abundances yield the amount of material the typical ~1 GeV cosmic ray has traversed (~60 kg/m2) which at speed c yields a typical age (~107 yr). These cosmic rays have been in the Galaxy for a much longer time than it would take them to traverse its 105LY diameter. This is the basis of the above statement that they have been stored in the Galaxy. Some of the cosmic rays enter the solar system and arrive at the earth's magnetosphere. If they are not sufficiently energetic, the earth's magnetic field (v x B forces) will cause them to be reflected back out to space. Otherwise they will penetrate the magnetosphere. This requires energies of up to 15 GeV depending on their initial direction of arrival and location relative to the earth's magnetosphere. Penetration at the earth's magnetic equator requires the most energy. The cosmic rays that thus arrive at the top of the earth's atmosphere are called primary cosmic rays. At the higher energies they are a good sample of the cosmic rays trapped in the Galaxy. The primary flux at the top of the atmosphere at mid latitudes is about 1 x 104 particles s-1 m-2, or one per square cm per second. Some of the secondary particles produced in the nuclear interactions were previously unknown to physicists and chemists because they exist for only a short time after their creation; microseconds or less. They decay to lighter particles which, in turn, may also decay to even lighter particles, one of which may be the well known and stable electron. Figure 3 illustrates some of the interactions and decays that take place in the atmosphere. The unstable particles are called mesons and they come in numerous varieties. Specifically ^ mesons (pions) are preferentially produced in the primary (first) nuclear interaction. The pion is a nuclear active particle with mass 15% of the proton mass (mnc2 = 140 MeV). It can be charged (+ or -) or neutral. The neutral meson decays extremely rapidly (10-16 s) into two gamma rays. A charged pion decays to a muon and neutrino in ~ 10-8 s, or it may suffer a nuclear collision with another nitrogen or oxygen nucleus, generating even more such particles. The primary proton, if it has sufficient remaining energy, will similarly interact with other nuclei as will neutrons and protons ejected from the first interaction. Thus, if there is sufficient energy, a core of nuclear-active particles will propagate along the initial incident direction until its energy is depleted. Most do not reach sea level, but they can be detected at high altitudes in the cores of the extensive air showers discussed below. A gamma ray from a decay may interact with the electric field of an atmospheric nucleus and create a pair of electrons (e+, e-) in a process called pair production, previously encountered in Section 10.2. In turn an electron passing close to another nucleus will be accelerated by its electric field and thereby emit a gamma ray, or several of them, in the bremsstrahlung process (Section 11.3). This process repeats itself if the energy is sufficient. Such electrons and gamma rays propagate downward as an electromagnetic component with negligible nuclear interactions. However, this soft component of the cosmic rays is relatively easily absorbed in the atmosphere and in matter, especially in materials of high atomic number, via the just described electromagnetic interactions. There is also energy loss due to the charged particles ionizing the atoms of the matter through which they pass. Figure 12.3. 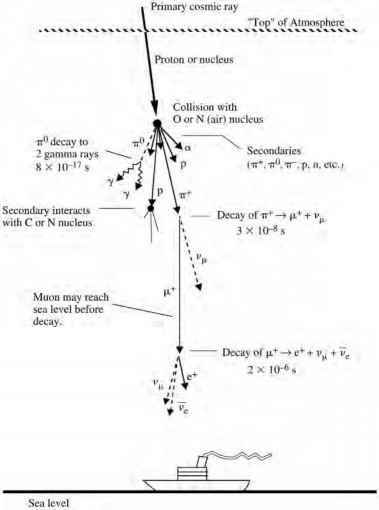 Sketch showing a high energy primary cosmic proton entering the atmosphere, its interaction with an atomic nucleus (oxygen or nitrogen), and the creation and decay of ^ and ^ mesons (pions and muons), The scattering angles are shown greatly exaggerated. Large fluxes of muons reach sea level and penetrate deeply into the earth. and two neutrinos with a mean life of 2.2 |s. This time gets extended by relativistic time dilation with the result that many muons reach sea level. The flux of muons at sea level is about one per cm2 per minute. They are passing through you and ionizing your bodily atoms as you read this. Muons are a hard component of cosmic rays at sea level. The muons do not interact with nuclei so they penetrate deep into the earth, losing energy only gradually via ionization losses of about 0.2 MeV per kg/m2 of material traversed. Thus a muon would lose about 2 GeV in energy as it traverses the atmospheric depth of 10 300 kg/m2 which is equivalent to about 10 m of water. Extremely energetic muons can penetrate hundreds of meters and more into the earth. The neutrinos produced in the ^ and fx decays will, as we learned in Section 2 above, mostly pass right on through the earth. Cosmic rays are not the ideal tool for doing astronomy because the particles, being charged, are deviated from their initial directions of travel by the magnetic fields of the Galaxy and the earth. Thus cosmic rays from many different sources will be mixed together when they arrive at the observer. In fact, they arrive more or less uniformly from the entire sky; no known discrete sources of charged particle cosmic rays, other than the sun itself, have been found. However, at the very highest energies >1019 eV, there is hope that one may find directions of enhanced cosmic ray emission because the magnetic bending is less. The flux of such particles is quite low, about 1 per km2 per year at energies > 1019 eV, and decreasing rapidly as energy increases. This makes difficult the acquisition of good statistical precision (Section 6.5) in measures of their characteristics. Nevertheless, cosmic rays are an important component of interstellar space, with an energy density comparable to those of the interstellar magnetic field, the microwave 3 K background, and starlight, ~1 MeV/m3. They also provide direct chemical analysis of the highest energy phenomena in the Galaxy. The study of these real bits of matter from distant astrophysical objects has provided substantial insight into their origins and history through the study of the element abundances in the primary flux. A primary cosmic ray of very high energy (>1 TeV; 1012 eV) creates an extensive air shower (EAS) in the earth's atmosphere. (SI prefixes are given in Table A3 of the Appendix.) The very high energy leads to the production of so many secondary particles that collectively they gained this name. The word "extensive" refers to the fact that the particles spread out laterally over as much as several hundred meters and up to several kilometers for the highest energy events (Fig. 4). The highest energy EAS detected have (so far) energies up to 300 EeV (3 x 1020 eV). Those above about ~1 EeV are sometimes referred to as ultra high energy cosmic rays (UHECR). The greater the energy of the primary particle, the greater is the number of particles in the resultant EAS. Figure 12.4. 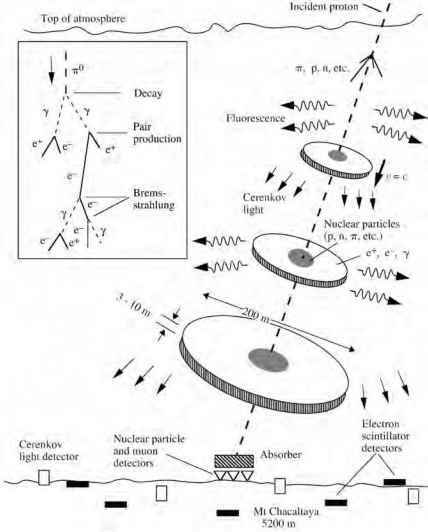 Extensive air shower showing the large pancake (disk) of electrons and gamma rays and the nuclear active particles (neutrons, protons, pions, etc.) in the core. The electromagnetic interactions in the disk are shown in the inset. Detectors on the ground can provide (i) a measure of the total energy by sampling the electrons and gamma rays at various points in the shower front and (ii) the arrival direction through precise measurements of the arrival times of the pancake because, in the figure, the right-hand detectors will be hit first. Fluorescence light from nitrogen is emitted isotropically and can be seen at large distances, whereas Cerenkov light is mostly directed downward. This sketch is based on the former Bolivian Air Shower Joint Experiment (BASJE) at 5200 m altitude designed to measure small showers (~1014 — 1015 eV) in a search for showers initiated by primary gamma rays. The nuclear components (protons, neutrons, etc.) near the center of the EAS are continuously undergoing new interactions with the atmospheric nuclei and thereby continuously feeding energy into the spreading electron/photon component. The mechanism for this is, as described just above, the production of mesons in nuclear interactions, their immediate decay to gamma rays ^ 2y) and the subsequent successive generations of pair production of e+, e- and bremsstrahlung emission of gamma rays. See the inset box in Fig. 4. As gamma rays beget electrons which beget gamma rays which beget electrons, etc., etc., the number of electrons and protons grows and spreads laterally because of electron scattering by Coulomb interactions with the atmospheric atoms. Most of these particles are highly relativistic because of the huge primary energy. Thus their velocities are all about the same (v & c), and the particles remain within 3 to 10 m of one another along the propagation direction. The result is the growing pancake of electrons and gamma rays shown in Fig. 4. Eventually, of course, the initial energy of the primary is shared among so many particles that this multiplication must cease and the shower dies out. 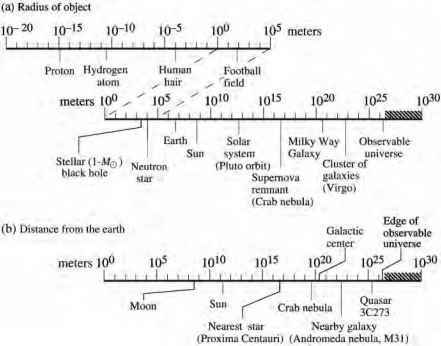 At maximum size, an EAS initiated by a primary particle of energy 1 PeV (1015 eV) will contain ~106 electrons, and a 100 EeV (102° eV) shower will contain about 1011 electrons at its maximum size. Cerenkov radiation and fluorescence EAS may be detected in two other ways. The relativistic electrons passing through the atmosphere travel faster than the speed of light in air and thus emit visible Cerenkov radiation (Section 2). Most of the electrons travel in the downward direction, but with some scattering in their directions of travel. Since the speed of light in air is almost c, the electron can travel only marginally faster than this. Hence the Cerenkov light is directed mostly in the direction of the electron's instantaneous direction of travel; 9 & 0 in Fig. 2b. The result is that a telescope impinged upon by this radiation will ideally record a ~1° blurred spot in the sky (actually the atmosphere) which indicates the arrival direction of the primary. The image in a telescope displaced from the shower axis will be elongated because it views the EAS track from the side by means of Cerenkov photons from scattered electrons. Cerenkov light penetrates the atmosphere easily, being visible light. Thus relatively small EAS, with primary energies as low as 1 TeV, which dissipate their electromagnetic component high in the atmosphere, can be detected at ground level via their Cerenkov radiation. See more below. The passage of EAS charged particles through the atmosphere results in the ionization of the nitrogen and oxygen atoms. Upon recombining and relaxing to a stable state, nitrogen emits faint visible and near-ultraviolet light (wavelengths 300-400 nm). This fluorescent radiation is emitted isotropically and hence can be detected with focusing mirrors at large distances from the shower core. Of course, clear dark nights are required for the detection of both fluorescence and Cerenkov light. The growing pancake of electrons and gamma rays, >100 m in diameter, makes possible the study of the relatively rare high energy primaries. In effect, the atmosphere "develops" the primary proton to a large size so that it can be detected and located with relatively few detectors (e.g., large scintillation counters) spread at wide intervals over the ground, Fig. 4. Otherwise, it would be impossible to study these events given the low flux quoted above (~1 km-2 yr-1 at >10 EeV). If the primary proton were never developed by the atmosphere, it would be necessary to blanket an entire 1 km2 surface with proton detectors in order to detect the ~ 1 event per year of energy at least 10 EeV! Scintillation detectors might contain a large (>1 m2) thin (~100 mm) piece of plastic in a light-tight container and doped with the appropriate additives so the ionization by EAS electrons traversing the plastic causes it to emit visible light. This light can be detected with a photomultiplier tube (PMT) which produces an electrical signal proportional to the amount of light impinging on its sensitive front window. We encountered other examples of scintillation detectors in Section 6.4. Since most electrons traverse the plastic completely, and if one knows their direction of travel (usually the case), the magnitude of the pulse of light detected is a measure of the number of electrons traversing the detector. If one samples the EAS shower front at, say, five or more locations it is possible to estimate the total number of particles in the EAS and thus to estimate the total energy of the initiating primary particle. Alternatively, or in addition, one can use water Cerenkov detectors to detect the electron fluxes. The EAS electrons emit Cerenkov light as they traverse the water, and the light is collected by one or more PMT. If the water is sufficiently deep that it absorbs most of the energy of the electrons and gamma rays at that position in the EAS, the pulse of light is a good measure of the integrated (over time) energy flux (fluence, J/m2) at that position in the EAS. Muons can be detected with detectors placed several meters below ground which shields them from both the nuclear and electron components. Muons are a good measure of the nuclear content since they are mostly the decay products of nuclear active particles. It is through such measurements that we know of the existence of protons in the Galaxy with energies up to about 300 EeV. For comparison, man-made accelerators produce particles of energies of "only" ~1 TeV, a million times less. The primaries of EAS are the most energetic particles known to humans. The detection of fluorescence from EAS has the advantage, as noted, that one can view an EAS from a great distance, 10 or more kilometers, if one has sufficiently large collecting mirrors to detect the weak near-ultraviolet signal. The HiRes Fly's Eye (for "high resolution") experiment in Utah, USA, has two sets of mirrors on two mountain tops separated by 13 km. Each mirror is of diameter 3 m, has a field of view of diameter -20°, and is focused onto an array of 256 hexagonal PMT, each of diameter 40 mm corresponding to 1° on the sky. 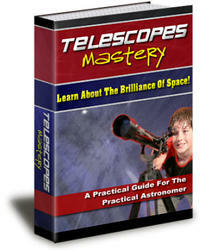 Each PMT is like one pixel in your CCD camera but with much worse resolution. Another mirror is like another camera, viewing a different part of the sky. The mirrors at each site (numbering 42 and 21 respectively) view around the entire 360° azimuth of the sky. Together the two sets monitor the sky above a land area of -3000 km2. As an EAS streaks through the atmosphere, it is imaged successively onto the PMTs at the foci of one or more of the mirrors. The total fluorescent light received from the entire track of the EAS is a measure of its total energy if the distance to it is known. The distance is obtained from the measured angular rate of the EAS motion across the field of view together with the knowledge that the EAS propagates at the speed of light. The precise arrival times of the fluorescent signal at each PMT are recorded for this purpose. These times also allow one to solve for the tilt of the shower axis from the vertical. If the shower axis is tilted so that it is approaching the cluster of mirrors, the signal from the bottom of the EAS will arrive sooner relative to that from the top than would be the case for a vertical shower. The analysis is actually somewhat more complicated. In practice, the entire set of PMT times and signal strengths is used in a multiparameter fit to determine the location, arrival direction, and total energy of the EAS. Observation of the same EAS by the second set of mirrors on the other mountain top serves to refine the shower parameters. The system is sensitive to EAS energies >0.1 EeV and collects -300 events per year >10 EeV. One well documented event of 320 ± 90 EeV has been reported. The extremely ambitious international Pierre Auger project for the detection and study of the EAS initiated by the UHECR is now under construction in Argentina (Fig. 5a) at an altitude of about 1400 m where these EAS reach their maximum development. When completed in 2005, construction will begin on a sister site in Utah. Each site will have 1600 stations with water Cerenkov detectors 1.2 m deep and separated by ~1.5 km over an area of ~3000 km2. The site will also include four groups of Fly's Eye detectors on the perimeter of the site. The combination of surface detectors and fluorescence in one array together with its huge collecting area makes the Auger project truly unique. Many aspects of the UHECR EAS can be measured with Auger. The large area of the site will yield sufficient numbers of EAS to look for "hot spots" of arrival directions on the sky and to obtain the chemical composition of the primaries through the manner in which the EAS develop in the atmosphere. The two sites at mid latitudes will yield good coverage over the entire sky as the earth rotates (Fig. 5b). This is important in searching for the hot spots.